With the recent DVD release of The Last Jedi, there is a lot of renewed interest in the movie. So, I had the pleasure to discuss two DK Publishing books about the movie with the hosts of Skywalking Through Neverland. 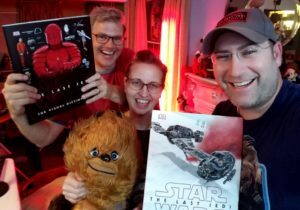 In the latest episode of the Skywalking Through Neverland podcast – just out today – our conversation covers both Pablo Hidalgo’s Star Wars The Last Jedi The Visual Dictionary as well as Star Wars The Last Jedi Incredible Cross-Sections, written by Jason Fry and illustrated by Kemp Remillard. The discussion, which was the bulk of the podcast (embedded below), beginning at 36:44 and continuing on through 1:34:07, was great, especially as Sarah brought in a bunch of “Canto Fun Bights” in our discussion of The Visual Dictionary. I have also written about the Incredible Cross-Sectionsbook, both on the Skywalking Through Neverland website, as well as a top 10 from the book on this website. Enjoy!